Better Than Shaking a Keg! Are you tired of carbonating your beer the unpredictable way? You crank up the PSI in the keg, shake, and wait with bated breath, hoping you didn’t just over-carbonate your batch. Using a diffusion stone pays off with a reliable level of carbonation every time. 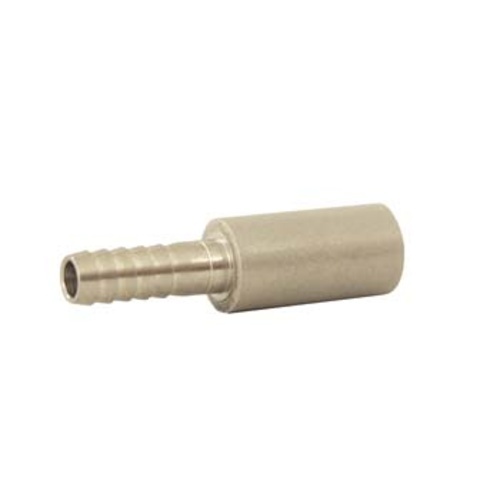 Our .5 micron stone is ideal to force carbonate your kegged beer, or as an aeration stone prior to fermentation. It produces nice small bubbles, giving more surface area for diffusion. To Use: Attach 2 feet of 1/4" tubing to the stone and the "gas in" dip tube inside the keg. (Tubing not included). Set your desired pressure on the regulator and gas gets emitted through the .5 micron stainless stone. The bubbles rise through the beer creating so much surface area contact between gas and liquid that the absorption rate is very rapid. This is very similar to how beer is carbonated in breweries. Cleaning & Sanitizing: It is important to know the oils from your skin can clog the small pores in the stone. We that you attach the tubing to the stone, then hold the assembly by the tubing while submerging the stone in boiling water for a few minutes to break down and drive the oils out. When the stone comes out of the boiling water, tightly wrap it in saniitized aluminum foil until you are going to mount it in your keg. Perfect for hooking up to a tank. Great price! Great stone to oxygenate your wort when pitching, nice small bubbles. The barb eventually separated but I epoxied it back; used for 10 years and still performing. I've used this on numerous batches and never had a problem with it. Good product. I have been using one of these for the last 8 years to oxygenate wort at pitching time. The 0.5 micron will filter the oxygen and produce fine bubbles giving more surface area for diffusion. A must have if you use pure oxygen. Just keep it clean and boil to sanitize. This is an excellent product at an affordable price. Ordered one and after a few uses, the barb separated from the stone. Second one now seems clogged. Works as intended. Carbonated keg well with higher pressure and short carbonation time. Did have to shake the keg a few times and let sit to get desired results. It did not do well with use with counter pressure bottle filler from keg. used for carbonation in kegs. works quite well. wasnt a huge fan of cranking up the PSI, shaking, and waiting. usually ended up over carbed. this requires a little more patience, but the results were much more reliable. simply boil to clean and try not to touch with your bare hands.